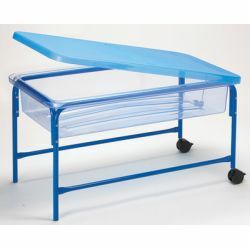 This strong and versatile plastic play table features a water release plug in the bottom for easy discharge. Includes a strong tubular frame fitted with two lockable casters for easy movement. Tray measures 431⁄4" x 237⁄8" x 81⁄2"D. Sturdy plastic lid included. Frame is 443⁄4"L x 25"W x 23"H.